Henley Symphony Orchestra’s annual outing to the Hexagon, Reading, was an inspired event, with the evening of music bookended by two great masterpieces, by Mozart and Mahler. However it was Sheku Kanneh-Mason, invited to play Elgar’s Cello Concerto, who was clearly the star attraction of the evening, and drew almost a full house to the Hexagon, even on a bitterly cold and wintry Sunday evening. Still only 18 years old, and come this May just two whirlwind years since winning the BBC Young Musician of the Year, the cellist is quickly gaining worldwide attention, so it was much to the orchestra’s credit to book the young star so early in his career. Choosing the Elgar concerto brings plenty of baggage for any young aspiring player. Few will ever forget the performance of Jacqueline du Pre, who first really popularised the concerto with her enthralling 1965 recording, while subsequent cellists of note have ensured the piece is firmly at the heart of the cello repertoire. Sheku Kanneh-Mason made clear, from his appearance bounding onto the stage in a kaftan-style top and wearing wonderfully stripey yellow and orange socks that he was definitely his own man. The concerto is notoriously difficult for any orchestra to accompany – and apart from the famous opening chords, which occasionally reappear throughout the piece – the cello part intertwines and joins in with the orchestra, rarely playing solo, making it a truly ensemble piece. Rather than the overt passion of the du Pre interpretation, Kanneh-Mason concentrated on the beautiful simplicity of the main themes, and worked hard to incorporate them sensitively into the orchestral interpolations. He demanded the most ethereal ‘pianissimos’ and at times as his part joined with the orchestral cellos, merged into their sound. The effect was entrancing, demanding his audience listen harder to see where the magic of the music was going. 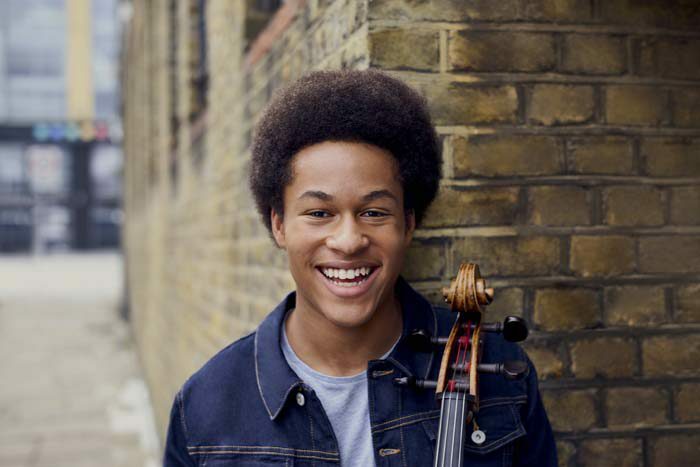 Sheku Kanneh-Mason was happily paired with conductor Ian Brown, who as a seasoned chamber musician and leading piano accompanist, carefully directed the orchestra in playing their demanding parts sensitively, but with confidence. The concerto was followed by an encore, for which Sheku delighted his audience further with a solo composed by himself, in simple folk style, entitled ‘Melody’. Mozart opened the evening, with a smooth, polished performance of the Marriage of Figaro overture, cleanly executed. And the second half was taken up by Mahler’s Symphony no.1 (The Titan), with exciting contributions from the horn section, ending with them standing for the final dramatic flourishes of the final movement, bringing the evening to an exciting close.